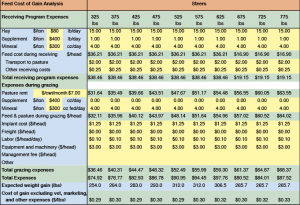 The Oklahoma Wheat Stocker Purchase Planner was developed to assist wheat stocker producers project economic profitability of their wheat stocker enterprises. With user-supplied data, the program projects returns from various purchase weights of stocker calves. The program is a joint project of the Departments of Agricultural Economics and Animal Science at Oklahoma State University. The program can be downloaded from: www.beefextension.com (click on “Stocker” and then “Software”). Only cells with a yellow background and black text are changeable. All other cells are calculated automatically by the program, are not accessible to the user, and have a light blue or green background. The program has five sections accessed by the tabs at the bottom of the screen. The tabs are labeled Producer Info, Cattle type, Steers, Heifers, and Results. Another tab “Feed cost of Gain” can be accessed through a macro on the “Steers” and “Heifers” tabs. 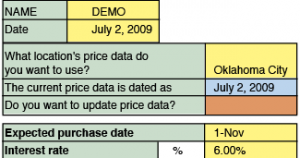 The first section (see Table 1) allows the user to enter a scenario name (“DEMO”) in the table below and the date of the scenario. Clicking on the location cell will produce a pop-up menu that allows the producer to choose a set of auction market prices, either Oklahoma City or Combined Oklahoma auctions. These prices are stored in a hidden tab and can be updated from an OSU website. To update prices, first connect to the internet. Then open the spreadsheet. Click on “UPDATE PRICE DATA.” If asked if you want to proceed, click “OK.” Note, if your internet connect is slow, this may take several minutes. The screen may flash several times as files and tabs are opened and closed. Next enter the expected purchase date of stockers and an operating note interest rate. The user first must select a lightest and heaviest weight that will be considered for purchase (see Table 2). For both cells, a pop-up menu asked the producer to select a weight. Weights from 300 to 800 pounds, in 50 pound increments, can be considered. Next, the user selects the gender(s) to be considered. Purchase prices for stockers can be generated by clicking the “Generate prices” button on the top of the page. Note, the user should update prices as described in the Producer Info section above before using the “Generate prices” feature. If the data file is missing historical prices for some gender-weight combinations, the program will prompt the user to manually enter these prices. Generated prices can be manually overwritten by typing the expected purchase price in the appropriate cell. Next, the user must enter information on days in a receiving programming, days grazing wheat, expected rates of gain, death loss and stocking rates. Note, to copy cell’s value downward to end of its column: 1) enter the value to copy and press enter; 2) return to the cell with the arrow keys or with the mouse; and 3) double left click on the cell. Its value will copy down to the end of the entry fields. Table 2. “Cattle type” tab. If the user selects “Steers” or “Both” in the gender cell on the Cattle type tab, a tab labeled “Steers” will be visible. (Otherwise, this tab is hidden.) Similarly for Heifers, the tab is only visible if “Heifers” or “Both” was selected in the gender cell. The Steers and Heifers tabs (as in Table 3) are identical in appearance and date entry requirements. The discussion below applies to both tabs. The Steers (or Heifers) tab is divided into two tables. The top table requires the user to enter veterinary, production and marketing costs. 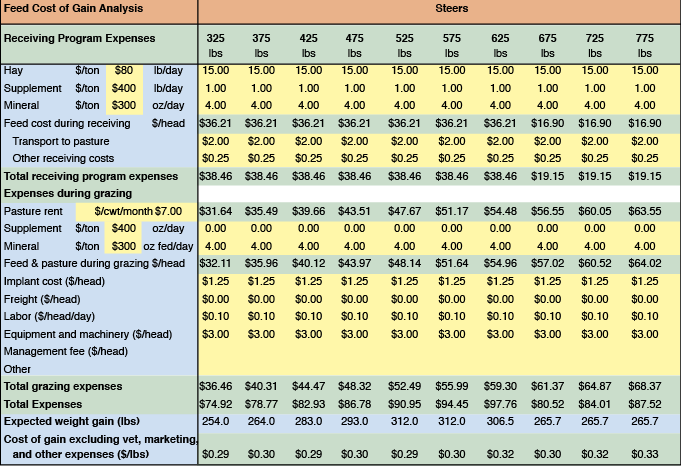 A detailed sub-table can be used to enter “Feed cost of gain” by clicking on any cell in the “Feed cost of gain” row and then simultaneously pressing “ctrl-t” (See Table 4). The results from the “Feed cost of gain” sub-table can be transferred back to the Steers (or Heifers) tab by clicking on the “Return to Steers” button (or “Return to Heifers” button). Table 4. Feed cost of gain. The result tab reports three results. First, the highest returns per head and the associated purchase weight are reported by gender. Second, the highest returns per acre and the associated purchase weight are reported by gender. Third, the lowest breakeven price is reported by gender. For producers that rent wheat pasture, the appropriate decision aid is likely the purchase weight and gender with the highest returns per head. For producers that own wheat pasture, the appropriate decision aid is likely the purchase weight and gender with the highest returns per acre. For very risk-averse producers, the purchase weight and gender with the lowest breakeven price might be advisable.